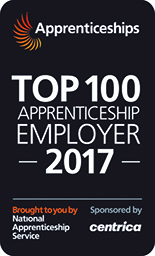 We’ve always been proud to support the next generation of talented craftsmen and women, but we’re even more proud that Brown & Carroll has been named a Centrica Top 100 Apprenticeship Employer at this year’s National Apprenticeship Awards! The prestigious list, now in its sixth year, is compiled by the National Apprenticeship Service and recognises those companies which offer excellence in apprenticeship training. Charlie Keane, Jamie Crawley, Daniel O’Brien, David Guiton, Mike Pearson and Trevor Baker were at the awards ceremony at London’s Grosvenor House Hotel to hear the long-awaited announcement. Earning a coveted spot on the Top 100 Apprenticeship Employer list is no mean feat. We were up against hundreds of companies from around the UK, all undergoing a tough selection process for a place on the final list. 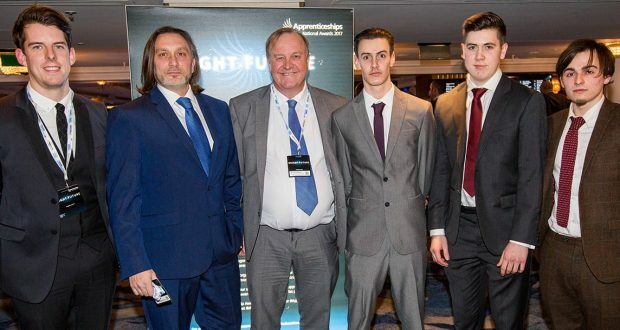 However, it was our long-term record of producing successful apprentices, our commitment to their career development and our robust training programme in partnership with Procat that really stood out to the judges. They were also most impressed to learn that 27 of our 30 graduate apprentices are still with us – many in managerial positions. Our commitment to apprenticeships isn’t just about earning national recognition. It’s absolutely essential to the work we do, helping us foster home-grown talent and train up the skilled craftspeople of the future to produce the high-end joinery for which we’re renowned. “Being named one of the country’s leading apprenticeship employers is a true honour. It is down to consistent investment in our apprentices, both during and beyond their training, and the hard work of everybody who has either mentored or worked alongside them – particularly Mike Pearson and Gavin Mills – that we’ve received this well-earned recognition.